Volume 6 in a collection of photographs by Captain Samuel Sweet, arranged in six folders. Each photograph in Folders 1-5 and some in Folder 6 have separate records in the catalogue and have been previously digitised. By searching on Collection: Sweet Collection, these records can be drawn together. Additional photographs in Folder 6 can be viewed by taking the browse album link attached to the record B 72483/6. [General description] A full-length portrait of a bearded Samuel White Sweet, standing with his right hand resting on an elaborately carved table. 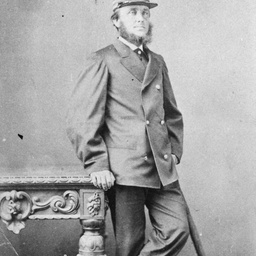 He is wearing a cap and double breasted jacket and holding a furled umbrella in his left hand. He left his career as a Master Mariner in the British Navy to become one of Australia's first great outdoor photographers. Papers (copies only of originals held in England) consisting of certificates and references. See below for details of items. 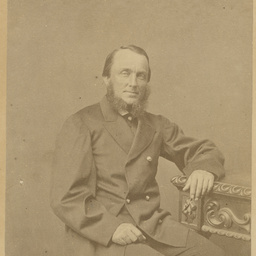 Records of Captain Samuel White Sweet consisting of photographic images, together with letters and certificates received by Samuel White Sweet and by Elizabeth Sweet, nee Tilly (1859-1873). 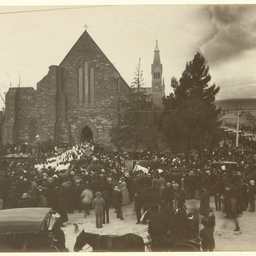 Funeral procession exiting St Paul's Church and crowds gathered for the funeral for Alexander Russell, Dean of Adelaide, who died in 1886. (Sweet Adelaide). 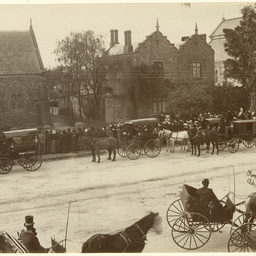 Crowds gathered and view of horses and buggies waiting in Flinders Street during the funeral for Alexander Russell, Dean of Adelaide, who died in 1886. (Sweet Adelaide). Crowds gathered at the corner of North Terrace and King William Street as the funeral procession for Alexander Russell passes. Horse tram 82 is visible in the foreground. (Sweet Adelaide). Adelaide Arcade viewed from upper level at Rundle Street end with everyone standing still for the photograph to be taken. Ornate fountains can be seen in the middle of the arcade with the nearest one representing two children holding an umbrella. A staircase leading below ground level is surrounded by wrought iron railings. Beautiful electric lamps line the arcade and others hang suspended from the ceiling. 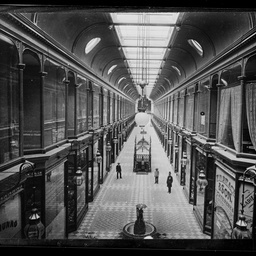 The arcade was one of the first Adelaide buildings to use electric lighting. The Carrara marble and black and while encaustic tiles form elegant designs. 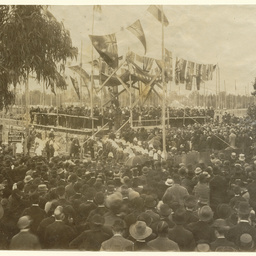 Crowd assembled for the laying of the foundation stone for the Jubilee Exhibition Building 21 June 1886. Official guests are on a raised platform above which flags are flying. 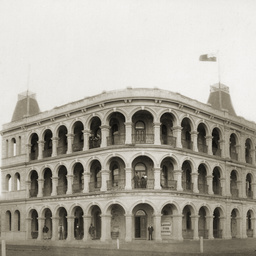 A researcher has suggested that this photograph may have been taken after 1901 because of the flags which appear to be the official national flag of Australia, which was designed and came into use after Federation in 1901. 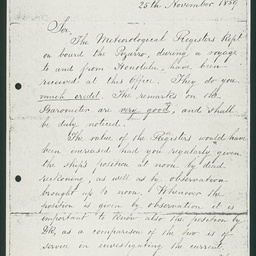 However, this flag design may have been a precursor to the national flag as the Southern Cross constellation has been used to represent Australia since the early days of British settlement, and each of the stars has five points, unlike the national flag design, in which the stars in the Southern Cross constellation had between five and nine points, while the Commonwealth or Federation Star originally had six points. 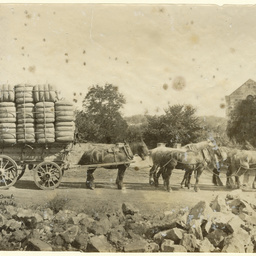 Wagon, fully laden with wool bales, with team of eight horses, probably at Bungaree Station. (Sweet Adelaide 632). White Hart Hotel, south side of Hindley Street east corner of Peel Street, frontage is 13 yards. The White Hart Hotel existed from 1840 and was also known as Volunteer. It was demolished in 1973. 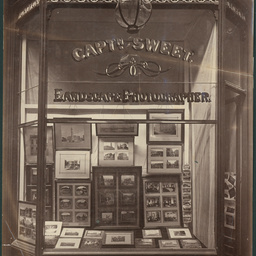 At the time of this photograph the proprietor was FW August Klauer. Grave of Captain Samuel White Sweet. 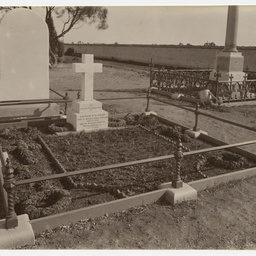 Captain Sweet died of Apoplexy at Riverton on 4 January 1886 and his funeral was conducted at the North Road Cemetery on 5 January 1886. 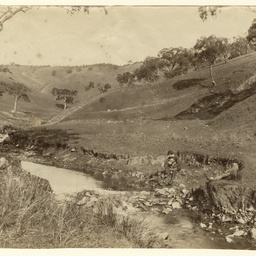 Album of views taken in Adelaide and the Adelaide Hills, with some photographs attributable to the photographer Captain Samuel White Sweet. Views include street scenes in and around Adelaide showing prominent buildings and the Botanic Gardens, Glenelg and Port Adelaide, as well as Norton's Summit, Waterfall Gully, Morialta, and Bridgewater in the Adelaide hills. Woman with an umbrella pictured on the roadway under large gums near the corner of Old Belair Road and Evans Avenue, Mitcham, marked 'Sweet Adelaide 584'. A researcher has suggested that the woman may be Elizabeth Sweet, wife of photographer Samuel Sweet. See also B 3723 and B 43123 for other photographs taken by Samuel Sweet, featuring his wife. An album of photographs by SW Sweet, featuring scenes around Adelaide. Portrait of Samuel White Sweet, seated with his left hand resting on a table. 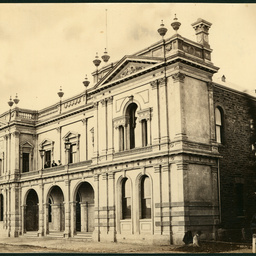 ALBUM: Volume of 50 photographs of early Adelaide. To see individual images do a NUMBER search on B 58005/1-50. 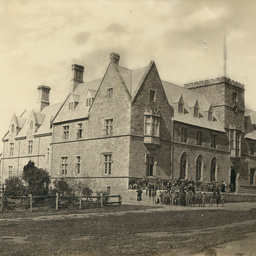 [General description] Saint Peter's College at Hackney.Young students dressed in uniform and hats are standing on or near the terrace. The three storey building holds an imposing position in front of the school playing fields. A rustic wooden fence encloses a garden next to the main school building. [On back of photograph] St. Peter's College 1872-86. Sweet Adelaide 852. 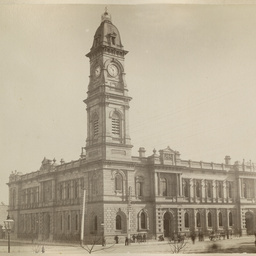 [General description] Constructed by the Largs Bay Land and Investment Company in 1882, this three-storied, white-arched building was built of stone with rendered masonry. The architects were Ernest H. Bayer and Latham A. Whithall. Its roof features two cupolas topped with widow's walks designed for watching ships. People posing for the photographer in front of the hotel and on its balconies were probably the hotel manager's family and staff. [On back of photograph] 'Largs Hotel / 1883-86'. (Sweet Adelaide 113). 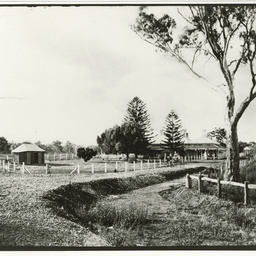 Quorn Railway Station. Sweet Adelaide 514. 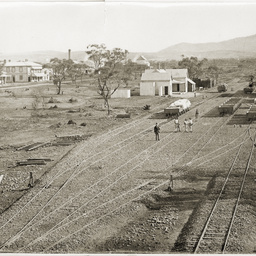 Quorn Railway Station opened on 15 December 1879 as the interim terminus of the Central Australian Railway from Port Augusta. In 1881 Quorn became a junction station with the opening of the Peterborough-Quorn railway line. The photograph, taken from a height, shows multiple railway lines, the station and further buildings in the background. 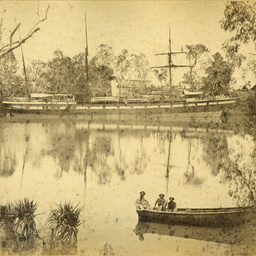 [Genera description] The SS 'Tararua' moored on the Roper River, 96 miles from the mouth. The ship is reflected in the water. Three men are seated in a rowing boat in the foreground and another man is standing on the yard-arm of the vessel. Copy in Sweet Collection folder 5 has Sweet signature (Sweet Adelaide 887). This ship, seen in such a peaceful setting here was later wrecked at Waipapa Point, New Zealand on 29-30th April, 1881 with 133 lives lost, New Zealand's worst maritime disaster. [On back of photograph] ''Tararua' at Roper River / 1972. (Chartered for conveyance of horses and stores for the Overland Telegraph) / Presented by Mrs. C. Trinne'. Saltia Hotel. 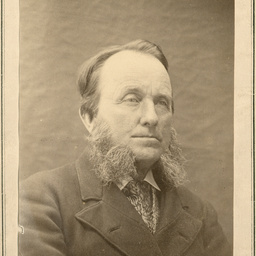 David Lithgow was the licensee in the early 1880s. Copy in Sweet Collection folder 5 has Sweet signature (Sweet Adelaide 397). Saltia was a town between Port Augusta and Quorn. 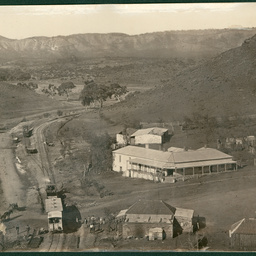 The hotel as built in 1859 to service the bullock drivers and the proprietor was David Lithgow. A school was established in 1864 with twenty students. Evening classes were available for students who could not attend during the daytime. By 1880 there were forty three students attending the school. Thomas Lees house was demolished to make way for the railwayline and later the town died as there was no need for the bullock teams to stop at Saltia. A famous son of Saltia was John Maslin (1826-1908) who was a sheep property owner. View of Strathalbyn. Copy in Sweet Collection folder 5 has Sweet signature (Sweet Adelaide 383). 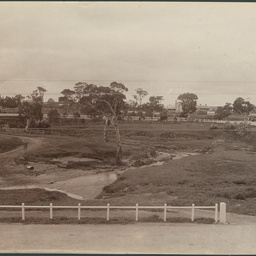 View of old track and ford to cross River Angas before St Andrew's Bridge installed. Probably taken from the Southern Argus building looking east. St Andrew's Church and bridge in background. (information supplied by a researcher). Two young men resting by Brown Hill Creek at Mitcham. One is holding an infant on his lap. 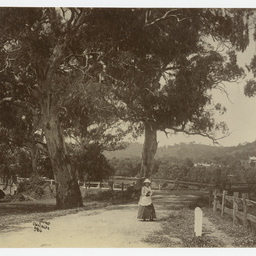 A similar photograph taken at the same spot probably on the same day, but with a woman near the creek and a small child in the foreground, is in Sweet Collection Folder 6 (see B 72483/50). 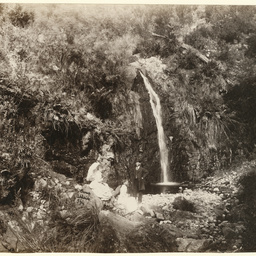 Waterfall Gully with three people posed at the base of the falls. One woman has a white parasol. (Sweet Adelaide 564). [General description] The photographer has used the telegraph wires for an interesting effect in this scene of city street and buildings. The traffic is all horse drawn and prominent is the Kensington horse tram number 76 displaying a sign advertising Shierlaw's clothing and tailoring business. The Industrial Buildings is in the centre. Bertram & Cornish and H. Jones Photographers are on the corner of Hindley Street. On the far right the E.S.& A. Bank building can be seen. [On back of photograph] 'King William Street, west side.' (Another hand) 'Donated by Mrs. R.C. 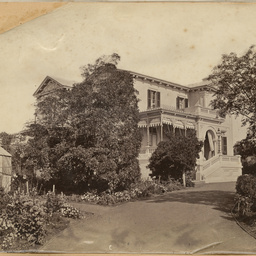 Edwardes, Glenunga.' Sweet Adelaide signature with inverted anchor symbol or 7. Other copies are held in Sweet Collection folder 5 & 6. 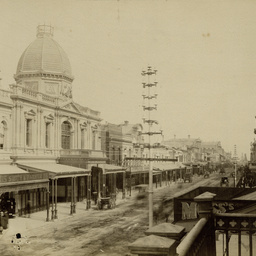 Rundle Street, South Side, showing entrance to Adelaide Arcade. Smudged Sweet signature, possibly Sweet Adelaide 72 or 92. 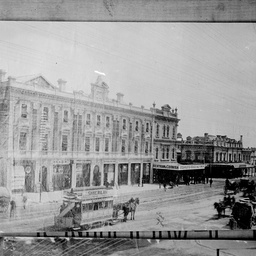 The photograph shows Rundle Street looking west from a point opposite nearby near Twin Street. The Coat of Arms on the cupola of the Adelaide Arcade is of interest. When the arcade was built in 1885 the promoters decided to hold a competition to design a Coat of Arms as there was not one at the time. There was much discussion about the Australian Colonies adopting a Coat of Arms. Later in 1908 King Edward VII officially granted the Coat of Arms but it was replaced in 1912 by King George V and the 2nd Commonwealth Coat of Arms. The difference is the positioning of the native animals and the words Advance Australia. 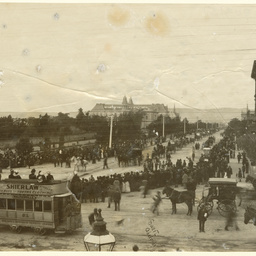 In the photograph the electricity poles can be seen along Rundle Street. Electricity was introduced in 1895. Pirie Street, south side. German Club 12 yards west of Chesser Street. The German Club was formed in Adelaide in 1854 by a group of upper middle class German emigrants. This impressive building was erected in 1880s. In 1886 a less exclusive German Club was formed, called the South Australian German Association. 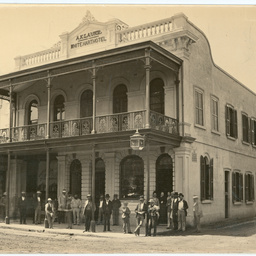 The original club folded in 1907.